Extreme Adventure Tour takes you on a jungle adventure the whole family will remember. Zip lines, ATVs and cenotes combined into one awesome tour! Our experienced guides will take you from treetop to treetop on amaing zip lines and bridges. 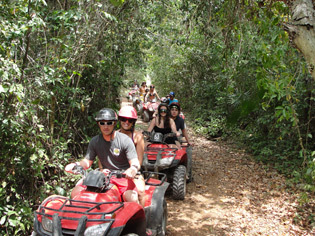 Next, hop on ATVs to drive through the jungle trails to 2 fresh water cenotes (water-filled caverns). There you can swim in the cold, fresh water, jump off a cliff or zip line into the water. Towel, sunscreen (biodegradable), sunglasses, swimsuit, camera & insect repellant. Wear light clothes you don't mind getting dirty. Tennis shoes or sport sandals.